Carolyn Pampino, design executive for IBM’s Enterprise Social Solutions, describes herself as the kind of person who “gets a ton of email and can’t get to all of it in a single day,” all of which leaves her feeling guilty that she probably missed a key message either from her boss or someone on her team. But even she might not feel as guilty as the so-called Zero Inboxer, who can’t stop working until every last email is dealt with. 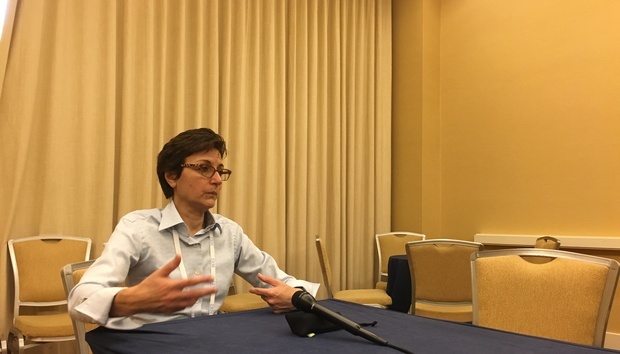 IBM has people who fall into either camp in mind as it designs its collaboration and other products, Pampino said this week during an interview at the IBM Connect conference in Orlando. “This is kind of the root of the problem we need to solve,” she says. IBM is addressing this challenge in large part through the efforts of designers like Pampino, not just through engineering and development efforts, though all are intertwined. IBM has employed “design thinking” to focus on how people use and embrace its software, and this entails everything from user research to interaction design (think clicking through software) to visual and front-end designers. While IBM is far from alone among tech companies to embrace design thinking -- Microsoft and SAP are among others -- Big Blue is definitely pushing it these days. Its IBM Connect conference agenda is dotted with design thinking sessions, includng those focused on app development, virtual personal assistants and enterprise collaboration. These efforts can be seen in the design of IBM products such as Verse, the newfangled messaging/calendaring program rolled out last year. A problem IBM tried to solve there was not just reading all one's messages, but surfacing the really important ones. "Filtering the relationship around people became a really important piece of that," Pampino says. So too is helping end users figure out if something important is trending today within their network that they need to focus on, she says. Design thinking also plays a role in making the smarts of IBM’s Watson cognitive computing accessible through IBM collaboration products, says Pampino, who previously worked in IBM's Rational app development business. Pampino, who operates out of Littleton, Mass, says IBM has been on a mission to stock its workforce with great designers from schools and industry around the world. "It is absolutely a dream job...they're coming in droves," she says. It's the kind of job that just hadn't been available until recent years at IBM, and now the company has design studios in Germany, Ireland, Shanghai, Texas and Massachusetts, to name some locations. IBM has also been preaching design thinking to IT shops, even conducting highly participatory and sticky notes-heavy workshops to get these organizations to really understand how end users will experience new applications before completing development and deployment. Pampino's talking about getting organizations to really root down into "the empathy of who am I doing this for and why." IBM's cloud-first approach to building products these days has helped the company better gauge customer reaction to design efforts, Pampino says. "We have more insight into what people are doing in the software, so we can really start using data to drive the experience," she says, adding an obligatory assurance that IBM isn't actually spying on customers by accessing such usage data. One challenge with shipping on-premises software, as IBM revealed it plans to do with its Verse messaging product, is that designers don't get the same sort of usage feedback. Until IBM really started going full-speed ahead into the cloud, it didn't know what it was missing.